The YHDC SCT-010-000 clip-on or non-invasive current transformer is widely used in DIY energy monitor applications, and is readily available on eBay for A$6 including post. 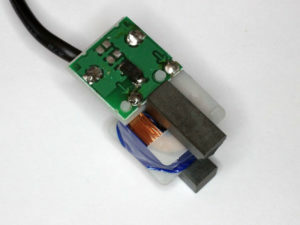 A key issue with current transformers is that current in the primary winding will cause excessive voltages in the secondary winding unless the secondary winding is suitably loaded. 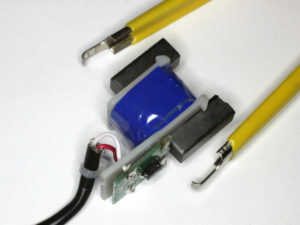 The broad rule of thumb is NEVER disconnect the output connections whilst current flows through the primary. 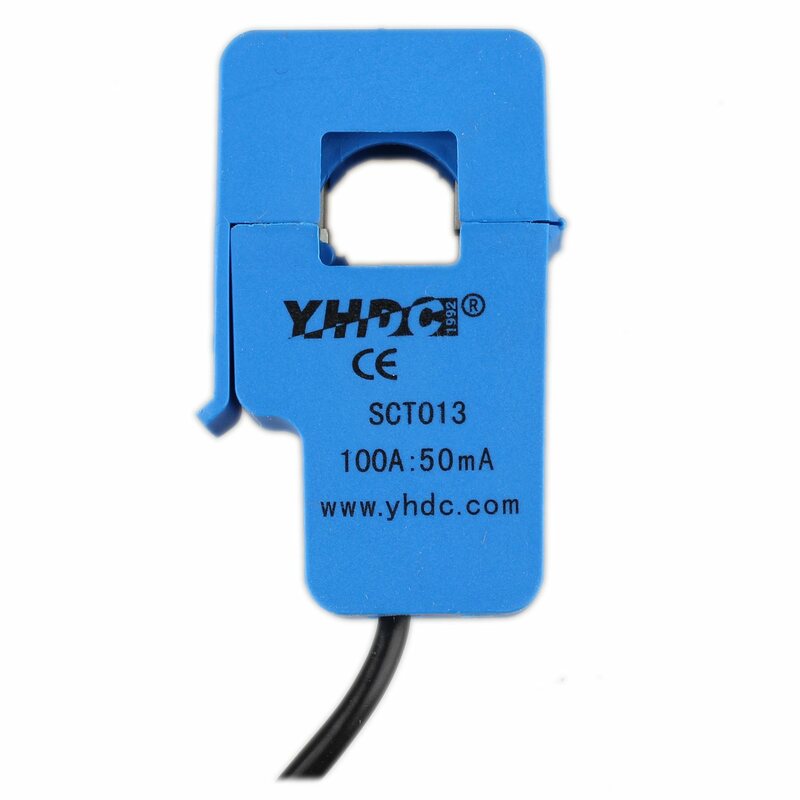 YHDC’s website is typical of Chinese web sites, and I could not find a datasheet for information on the internal circuit and possibly internal protection. 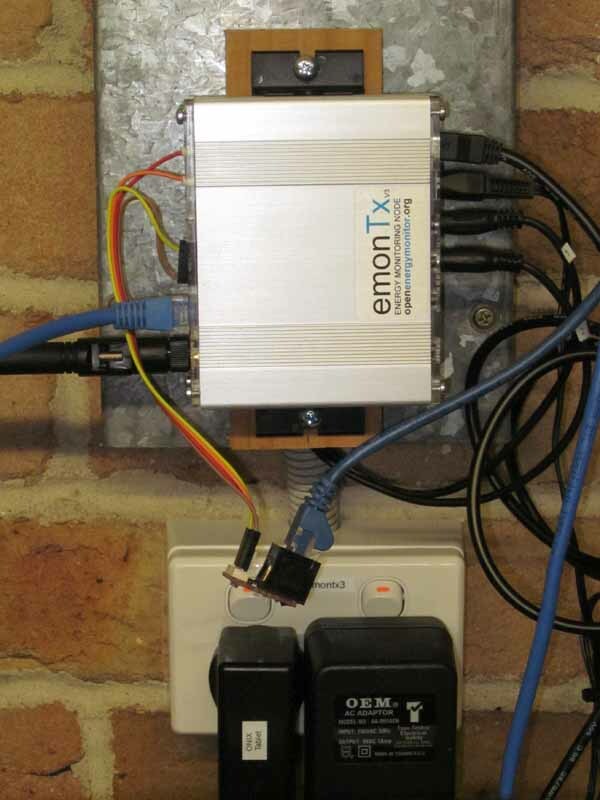 EmonTx3 is a measurement node for an energy measurement system. It has measurement inputs for 4 current transformers, AC voltage, 6 DS1820B temperature sensors and a meter pulse counting sensor. The standard configuration uses a HopeRF RFM69CW radio transceiver to emonhub running on some host. 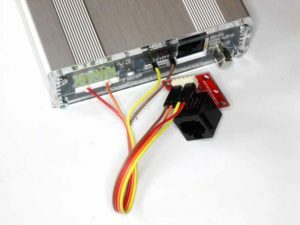 This article describes modifications to the system to use a wired serial connection to the emonhub host. Above is the emonTx3 board. The approach taken is a minimal change to existing firmware and software, no change to existing hardware, and inexpensive components to extend the connection. The existing firmware writes a debug stream to the connector used for firmware upgrade. It is a different format to that used for the radio link, and there are good reasons for that, but it means writing an interface handler for emonhub to parse the debug stream. The solution involves some hardware to interface the emonTx3 to the wire line, and a similar interface at the other end to the host running emonhub. Above is the debug stream from the modified firmware. Above is an adapter (~$3) from the TTL levels of the UART port to RS485. The port is currently run at 115200bps, and that can be carried 800m with good noise immunity on good copper using RS485. Above is the host end adapter. 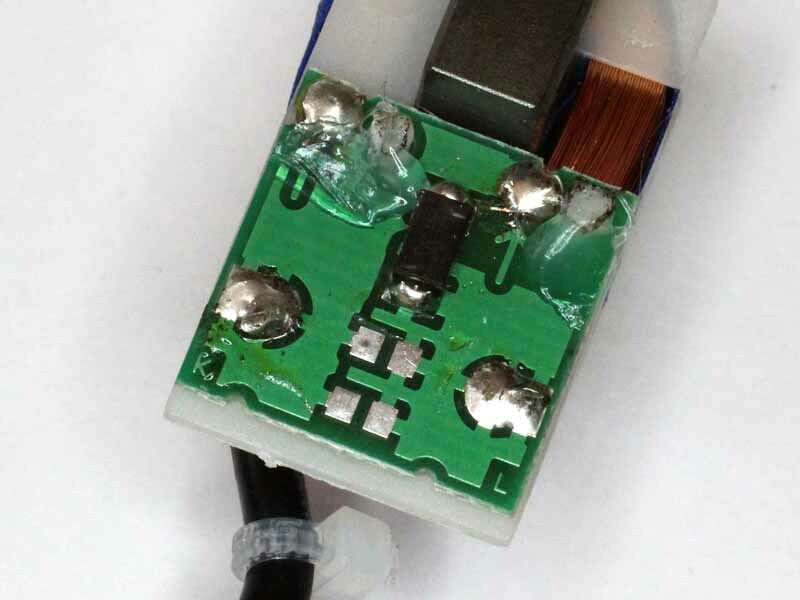 The firmware was changed to repurpose the output that may be used for switching power to the DS19B20 sensors, it is now used primarily as an RTS signal to the RS485 adapter to reduce current consumption when there is no traffic. In fact, the RTS signal has been asserted also at times when the DS18B20 sensors are read and it could also be used for its original purpose without conflict. 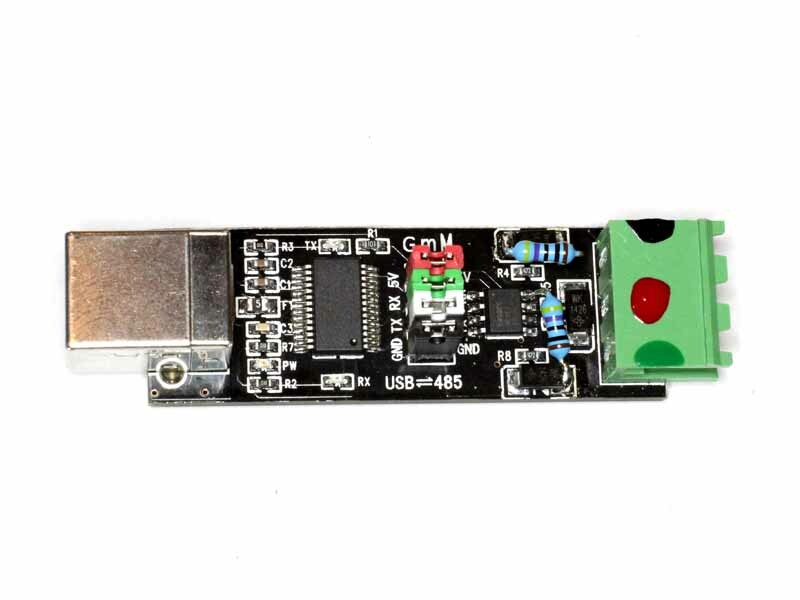 A problem with USB serial adapters is that they may acquire different device names depending on the order in which they are started. The link is achieved by adding the file /etc/udev/rules.d/75-RS485.rules with the contents below (the contents must match the actual adapter). The udevadm command will provide the information needed. An additional interfacer module was written to parse the debug stream, and it was hooked to the main module. The interfacer is configured in emonhub and port layout copied in from source. (the contents must match the actual adapter). The wired configuration is under test with emonhub installed on a Ubuntu server, and about 40m of cat5e cabling from emonTx3 to host. No issues have arisen. 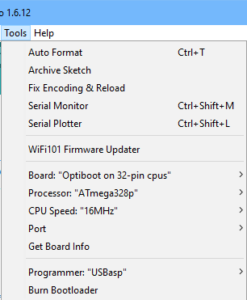 Optiboot is the default bootloader for Arduino Uno, and I use it other Arduinos (eg Nano) for all the good reasons Arduino put it on Uno. To make that work conveniently, I append the Optiboot boards.txt file to the Arduino distribution. Arduino 1.6.12 has several AVRDUDE related issues. It comes packaged with AVRDUDE which in my installation is located at C:\Users\owen\AppData\Local\Arduino15\packages\arduino\tools\avrdude\6.3.0-arduino6\bin\avrdude.exe . This reports itself as “Version 6.3, compiled on Sep 12 2016 at 17:24:16”. Also relevant is the avrdude.conf file (C:\Users\owen\AppData\Local\Arduino15\packages\arduino\tools\avrdude\6.3.0-arduino6\etc\avrdude.conf). This article relates to failures to program a bootloader, and failures to program the application using the very common USBASP. 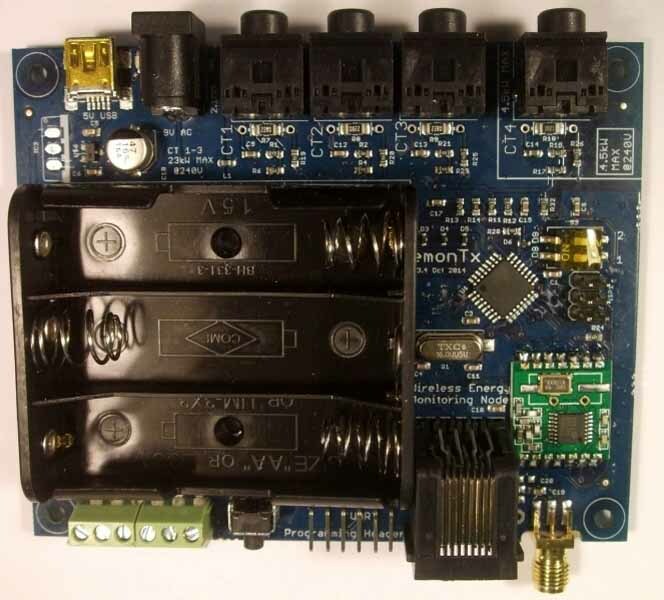 I have application for an analogue to digital converter (ADC) in a noisy environment, so a possible solution is to place an ADC module very close to the analogue sensors and use some form of digital connection back to a microcontroller. A possible protocol is I2C, and has the advantage that several ADC modules can be attached to the same bus, along with other peripherals Eg LCD. The above ADS1115 modules have four input channels, 16 bit conversion, flexible input mux, and were available on eBay for less than A$4, so worth a try. This article documents measurements of temperature and relative humidity (RH) over 10 days prior to implementing the fan solution to provide a baseline for designing the Fan controlled by humidity sensor. 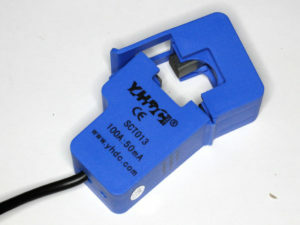 A RC-4HC datalogger was used to collect temperature and RH measurements over 10 days which included a range of late winter weather, some rain, some fine clear days. The logger was located at 1.5m above floor level in the shed in a relatively clear spot in the middle of the area..
At Time to get some experience with 32bit microcontrollers I wrote that after almost 50 years working with 8bit microcomputers and microcontrollers, I thought it about time to get my hands dirty on some 32bit microcontrollers. This article reports some work in the STM stream. I abondoned the ST Discovery board in favour of a low cost basic ST32F103 development board costing about $4 on eBay. The chip is a 32bit microcontroller clocked at 72MHz. As a learning vehicle, I decided to implement the functionality contained in Arduino thermistor thermometer – a tutorial. The development environment is Eclipse with the GNU ARM toolchain, a debugger probe, the basic development board, and a 1602 LCD display with I2C backpack and an inexpensive CP2102 USB RS232-TTL interface. Above is the working trial. The GDB debugger allows On Chip Debugging (OCD). 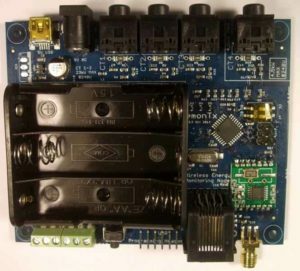 This article gives an outline of the process used in designing the Fan controlled by humidity sensor to use my Generic heating / cooling controller design (hcctl). 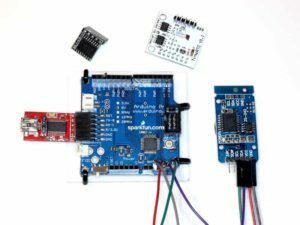 Arduino thermistor thermometer – a tutorial gave a method for designing a thermometer based on a formula predicting the behaviour of the sensor. This article explains a different approach where that is not possible. Above is a characteristic from the manufacturer’s data. The curves to no lend themselves to simple curve fits, so a cubic spine interpolation will be made based on key points from the curve. Four our purposes, the mean curve (green) is sufficient for design. Above, the mean curve was digitised to capture the shape of the curve, 17 points were used. 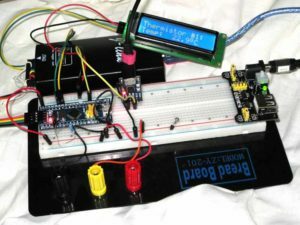 Arduino app to set DS1307 Real Time Clocks. 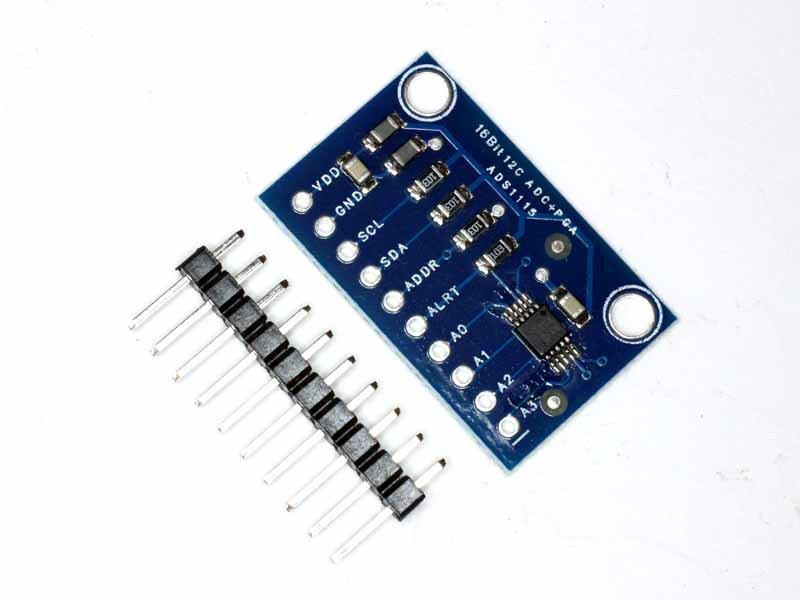 I use a number of implementations of the DS1307 or DS3231 Real Time Clock chip, preferably the latter these days as they are considerably more accurate and compatible with DS1307 code. In some applications, it is necessary or sometimes just better to preset the clock before connecting it into the application, and the need arises to set the clock ‘stand alone’. The method I have used for this has been clumsy and not as accurate as one might want for the DS3231, so this article describes a new solution. The solution uses an Arduino as the engine if you like. Above is an Arduino Pro, but a range of similar Arduinos would be equally suitable. ALso pictured are three RTCs, one connected to pins A2, A3, A4 and A5 providing GND, VCC, SDA and CLK respectively. Continue reading Arduino app to set DS1307 Real Time Clocks.